Rinse berries; pat dry. Cut the crunch bar into bite-size pieces. 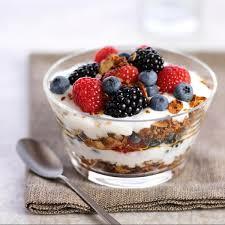 Using a glass bowl or cup, place ¼ of the cut-up crunch bar on the bottom and layer ¾ of the berries on top. Mix the vanilla extract into the yogurt and spoon on top of the layers. Sprinkle the remaining ¼ bar on top of the yogurt and add the remaining ¼ of the berries.